Greenhouse Gas (GHG) emissions due to human activity are the highest in history, with fossil fuels making up more than 80 per cent of the primary energy mix. Therefore, reducing the amount of GHG emissions the UK emits is not just necessary to help decrease global emissions, but also to meet legal requirements. This assessment reviews the sustainability of proposed Marine Renewable Energy (MRE) projects in the UK, in comparison with the sustainability of operational MRE projects in the UK or worldwide; including, tidal range energy, tidal stream energy and offshore wind energy. Key indicators of sustainability were established to cover the most important aspects of each overarching sustainability principle, including; environmental, economic and social sustainability. Sustainability indicators were selected systematically based on the significance/importance to the three dimensions of sustainability and the quantitative and/or qualitative evidence present. Technical perspectives of the different technologies have also been determined, as design and operation of the turbine technologies can inﬂuence the sustainability of MRE schemes. Sustainability indicators were assigned scores ranging from level 1-5, with 1 being the least sustainable and 5, the most sustainable. Mean scores were derived from the sustainability assessment protocols which allowed for an overall score of sustainability to be generated for the different MRE technologies. On the basis of this assessment, the higher the overall sustainability score, the greater the sustainability of the project. The proposed Cardiff-Weston barrage in the Severn Estuary has been identified as the most sustainable scheme (overall sustainability score of 13.4), in comparison with the proposed Meygen tidal stream array in the Pentland Firth (12.5) and the proposed Hornsea Project One offshore wind farm in the Humber Estuary, Yorkshire (11.6). Furthermore, improvements in technology have contributed to an increase in sustainability of the different technologies, with all proposed MRE projects in the UK being more sustainable than current operational projects in the UK or worldwide. This research investigated the use of green roofng as an approach to reducing coastal pollution. A computational hydraulic model was developed to analyse the impact of green roofs in relation to stormwater discharge after a range of rainfall events. The Plymouth city centre area was used as a case study, as in this area much of the rainfall runoff is collected in combined storm and foul sewers and any overﬂow from this system has the potential to cause signifcant pollution in the coastal environment. Computer simulations assessed the impact of different 'green' layer specifications for buildings, including different green roof overlay depths that ranged in depth from 50mm to 200mm. The research found that significant benefits could be accrued with even the thinnest green roof overlay. With just a 50mm overlay, stormwater runoff was effectively attenuated with a significant reduction in peak ﬂow in the sewerage network. The modelling results predicted that retrofitting green roofs on the top of Plymouth city centre buildings would reduce sewerage peak ﬂow by as much a 50 per cent. The study included a simple cost-benefit analysis to evaluate the investment and returns on a green roof scheme in Plymouth City centre. A simple green roof overlay was estimated to cost between £50 - £100 per m2 to implement, which equated to a total invested of £5.2 - £10.4 million to cover all suitable roof space in the Plymouth City centre area. The research judged that the scheme would provide a return on that investment within 5-10 years of completion. 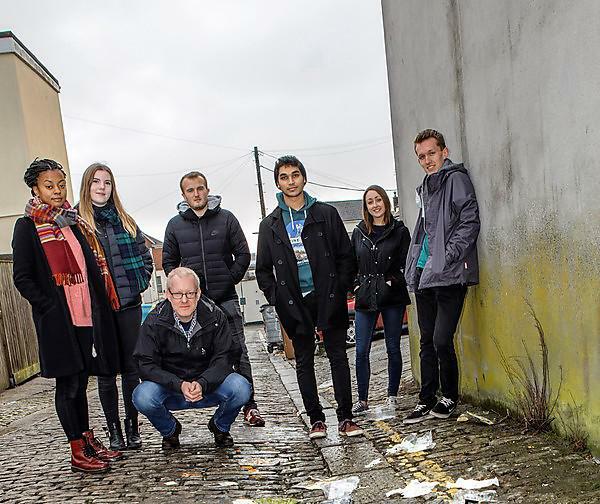 The results of this research project have attracted significant interest and a collaborative research project has now been considered between the University, Plymouth City Council and ARCADIS (a commercial civil engineering consultancy company in Plymouth). Further research, building from this report, has received funding and there is a possibility of further future funding to cover a design proposal. due to extensive industrial activity in the past. The environmental health of the marina was investigated through a chemical analysis of water samples for heavy metals (Cr, Mn, Co, Ni, Cu, Zn, As, Mo, Cd, Ba, Pb) in conjunction with biomarkers measured in haemolymph from the Blue mussel M.edulis spanning over 3 levels of biological organisation (biochemical, genetic, cellular). Results from these were compared to data collected from a pristine reference site (Trebarwith Strand, Southwest UK). The chemical analysis revealed elevated concentrations for all detected heavy metals at the marina, although a significant difference between the two sites (exact p<0.001) was only recorded for Mn. Cd and Ni concentrations at MF were found to exceed the Annual Average Environmental Quality Standards (AA-EQS) for coastal areas by 9 and 41% respectively, but not the Maximum Allowable ERQS (MA-EQS). The responses of 2 out of 3 biomarkers were consistent, with marked differences between the sites. DNA damage, measured through the Comet assay (expressed as %Tail DNA) was significantly higher at the marina (exact p<0.001) when compared to the reference site. Lysosomal membrane stability (measured via a modifed version of the Neutral Red assay) was also significantly lower (exact p<0.001) in mussels from Mayﬂower. Acetylcholinesterase Activity (AChE), however, did not follow the same trend and no significant difference was found between sites. The significant biomarker responses were attributed to the cumulative toxicity properties of all heavy metals detected, rather than their individual genotoxic/cytotoxic potential. These data elucidate the importance of combined biological and chemical investigations and highlight the benefits of biomarker use in environmental monitoring. The effects of gully blocking on natural revegetation and hydrochemistry at South Tavy Head (Dartmoor) and the subsequent implications for further peatland restoration. Ombrotrophic blanket bogs are signifcant terrestrial carbon stores but their environmental degradation has led to concerns surrounding carbon loss, water quality and habitat loss. The genus Sphagnum is the key peat-forming bryophyte in blanket bog ecosystems, with its establishment critical for limiting carbon loss and regaining carbon sink function over time. Hydrological restoration measures (gully blocking) were applied to part of the North Dartmoor SSSI blanket bog macrotope at South Tavy Head in autumn 2013. This resulted in hundreds of bog pools being created across the site which are now in the early stages of terrestrialisation. The current study assesses the effectiveness of the gully blocking in terms of the vegetation assemblages’ response to a suite of hydro-chemical and physical variables, three years post restoration. The median total vegetation cover percentage has increased from 34.5 per cent to 46.25 per cent since 2015 with Eriophorum sp. and Sphagnum spp. being the primary colonising species of the bog pools. 90 per cent of the sampled pools have established at least one species of Sphagnum at the pool surface and 94 per cent have at least one terrestrial species outside of the pool margins, which indicates a shift towards paludifcation. Within the past three years S. cuspidatum, S. denticulatum and S. papillosum have shown respective growth rates of 10.11, 10.47 and 4.34 cm yr-1, with S. papillosum exhibiting a signifcantly lower annual growth rate than the other species (F(2,17)=12.6, p=0.00). The results demonstrate that the turbidity and water colour levels have increased in 2016 from 2015. Whilst there are positive shifts with regards to vegetation, this is an indicator that the site will take many more years before achieving full restoration and become self-sustaining and therefore being able to maintain a stable water quality discharge and status as a successful peat generator. Due to Dartmoor’s location at the edge of the bioclimatic range required for blanket bog formation this restoration project will provide a strong case study for peatland restoration elsewhere, and especially in areas which are more climatically suitable. This study indicates that gulley blocking can be successfully employed to aid the restoration of degraded blanket bog vegetation and bare peat. However, it is recommended that monitoring continues for the next seven years to build up an understanding of the key limiting factors affecting the rates of terrestrialisation and paludifcation on blanket bogs.